Toshiba has announced its flagship camcorder called Camileo S10, a mobile phone-sized camcorder that can easily fit into your pocket. This new minicam is just 18mm thick but features a 2.5-inch screen, 4x digital zoom and 5 megapixel sensor. It captures video at a resolution of 1080p while other cameras only deliver 720p. The Camileo S10 design also looks stylish and cool with its brush metal and glossy cover. It is definitely one of the best choices in the mini portable camcorder market. 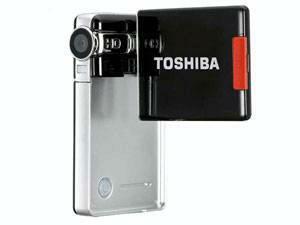 The Toshiba Camileo S10 will be available in UK at £129.99.